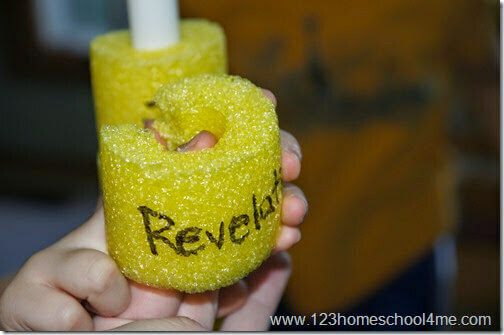 Here is a fun activity to help kids learn the Books of the Bile or the alphabet. Hint: If using to make the Books of the Bible I would make the Old Testament in one color and the New Testament slices in another so the pieces are easily separated. 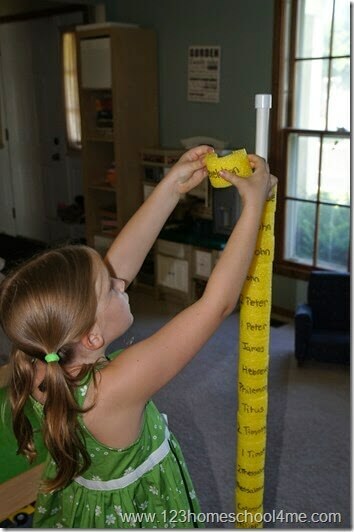 After you’ve made your stand you are going to need to cut your pool noodle – first all the way up the back, then into 1-2” slices. Note: The reason we cut it all the way up the back is so that if kids miss a letter or book of the Bible you can easily stick it in there. On each pool noodle wedge write a letter or book of the Bible. If using for alphabet letters this activity is best suited for Preschool & Kindergarten age kids. In that case you may want to make it shorter as they won’t be tall enough to put the pieces over the top. Of for a no-prep activity print on of our free Alphabet Printables. 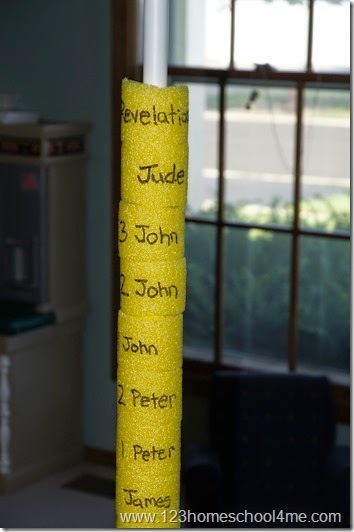 If using to learn the Books of the Bible, the activity is best suited for 1st-3rd Grade students. In that case making it 48” tall is perfect for the height of the kids and the number of books you need to fit in.